Will Streeter is a talented violin player. 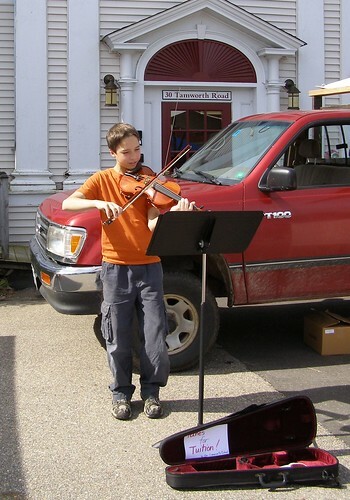 For the past few years he has entertained each week at the Tamworth Farmer’s Market. Will’s parents produce vegetable, dairy products, honey and maple syrup on their farm. Will has always been home-schooled, and is attending The Community School this year. I’m sure that Will will bring talent, diligence and creativity to his school experience. This post is in memory of Steve Damon and his 40 year “Who’s Who: Photographic Portraits Of Tamworth” Project.